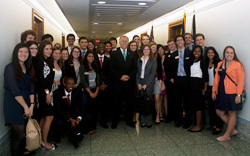 The Class of 2018 gathered with the US Senator Thom Tillis of North Carolina, one of their Learning Lab II speakers, at the Dirksen Senate Office Building. Students in the Park Scholarships Class of 2018 traveled to Washington, D.C. during their fall break for the Learning Lab II experience, designed to allow sophomore Park Scholars to develop a critical understanding of a nationally-relevant topic by interacting with leaders immersed in that issue. The class opted to explore the United States’ role in addressing infectious disease both domestically and internationally – a topic they selected nearly a year ago, when West Africa’s Ebola virus epidemic dominated the world’s headlines. While some members of the class initially expressed apprehension about this topic, all ultimately found it to be a remarkably fascinating launch pad for discussions of leadership challenges. Based on their conversations with scientists, government officials, and communications professionals, many students came away from this Learning Lab II with a newfound respect for the kind of nuanced collaboration required to manage issues as complex as infectious disease outbreaks. Members of the class also noted the emphasis on precautionary – rather than reactive – measures as a common theme among the presentations they heard. Maggie Linak ’06 spoke with the Class of 2018 about her work with the 2014 Ebola epidemic in West Africa. Numerous Park alumni played a role in the Class of 2018’s successful Learning Lab II. Albert Blackmon ‘08, Josh Chappell ‘14, Greg Mulholland ‘07, and Jacqueline Smith ‘06 assisted the trip planning committee in securing compelling presenters. In addition to serving as a presenter herself, Maggie Linak ‘06 led the class on an informative nighttime tour of Washington, D.C.’s monuments. John Kelly ‘07, Kylie Goodell King ‘08, and Stephanie Solove ‘13 met with the Class of 2018 during the first evening of their trip to discuss leadership challenges they encounter in their respective fields. Finally, William Coe ‘14, Caitlin Cox ‘12, Leah Haile ‘13, Alex Hall ‘03, Justin Hills ‘14, and Kirk Southern ‘10 joined the sophomores for various components of their time in the nation’s capital. 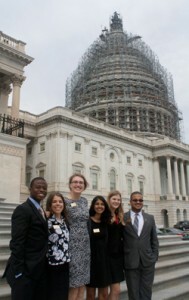 The Class of 2018 Learning Lab II Committee on the U.S. Capitol steps. 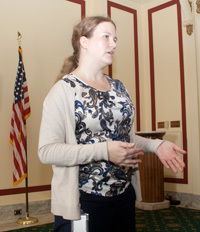 In addition to meeting with speakers, while in Washington the Class of 2018 toured the U.S. Capitol Building; witnessed the changing of the guard at Arlington National Cemetery; saw a performance by the Capitol Steps at the Ronald Reagan Building and International Trade Center; dined on traditional Ethiopian and Cuban cuisine; and, in small groups, visited points of interest such as the Natural History Museum, U.S. Holocaust Memorial Museum, National Gallery of Art, and National Zoo. 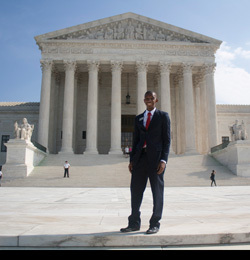 Several students also participated in the 20th annual Million Man March on the National Mall. View more photos from the Class of 2018’s Learning Lab II in this Facebook album.